If you’re in the process of working on a new closet one of the key decisions you’ll need to get your arms around is if it be better to have a wall hung closet (this is one which floats above the ground and is attached with a steel rail to the wall studs) or a floor mounted unit (this one sits on the floor and is attached using brackets). Choosing between these two systems is not tough after you get a handle on your answers to the following 5 questions. Question #1 – What is your budget? 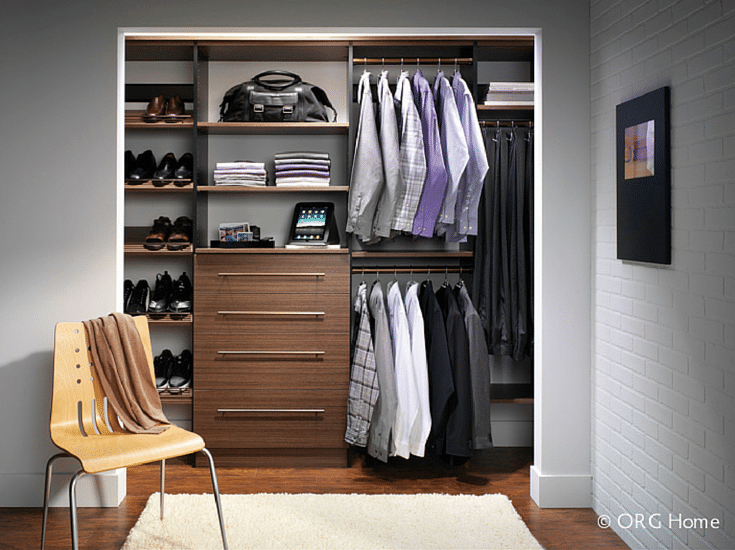 If your budget is tight you will seriously want to consider the floating wall hung closet system. These units require substantially less material (there are generally no moldings and trims and they do not extend to the floor) and labor time to install is less than a floor mounted closet. While wall hung systems can be used in any room they are more popular in kids or guest bedroom closets than in a master walk in closet. So if your budget is tight (or you’re looking at a kid’s bedroom closet for your Dublin or Westerville home) the wall hung system may be best. 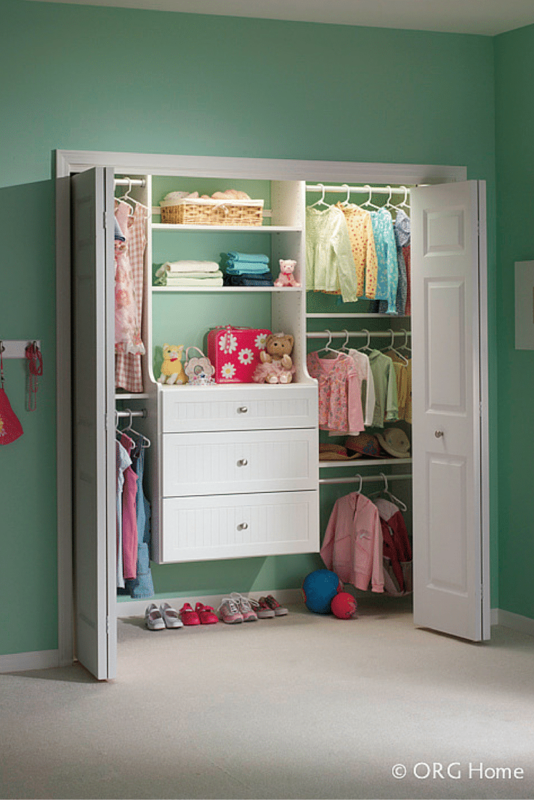 Question #2 – Will a family member with a wheelchair use this closet? 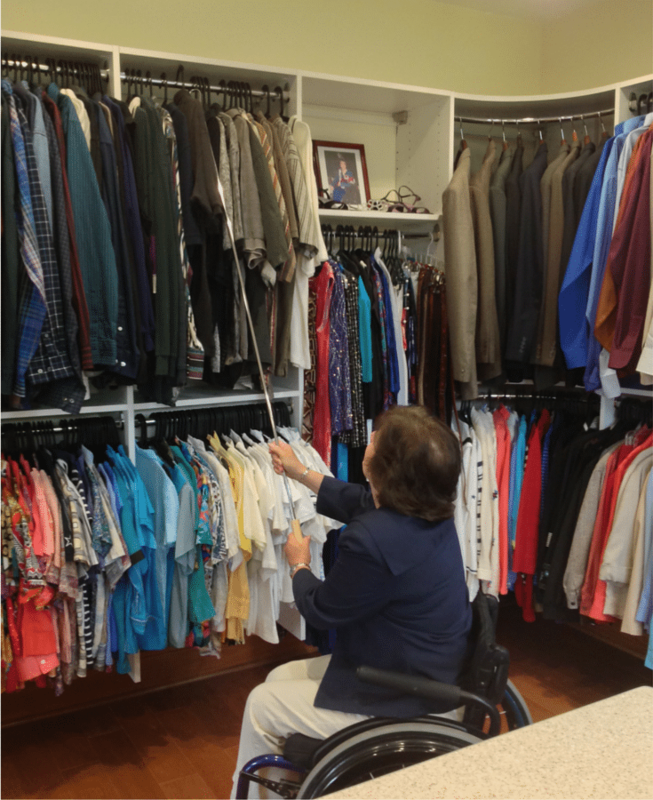 A closet built for a wheelchair needs to be designed with accessibility in mind. A floor mounted unit (with it’s base molding trim) can be challenging for someone in a wheelchair because it provides a barrier to get close to the drawers and clothing rods. For this reason the wall hung system will be more practical and is more cost effective. Question #3 – Do you have a lot of stuff stored in your closet? OK – I have to confess, even though I’m in the closet business my current walk in closet has way too much stuff in it! I not only need a major dose of decluttering, but my builder “designed” closet (it actually is not much of a design – just a few closet rods anchored into the sides of the walls) is not structurally created to maximize the use of our space. If you have a lot of things (even after you’ve gone through the decluttering process) your better choice will be a floor mounted closet. You may be asking why? Since the floor mounted units have the ability for deeper cabinets and drawers (up to 24” deep) vs. a wall hung system (which has a maximum depth of 14”) you’ll be able to comfortably fit more items in your space. 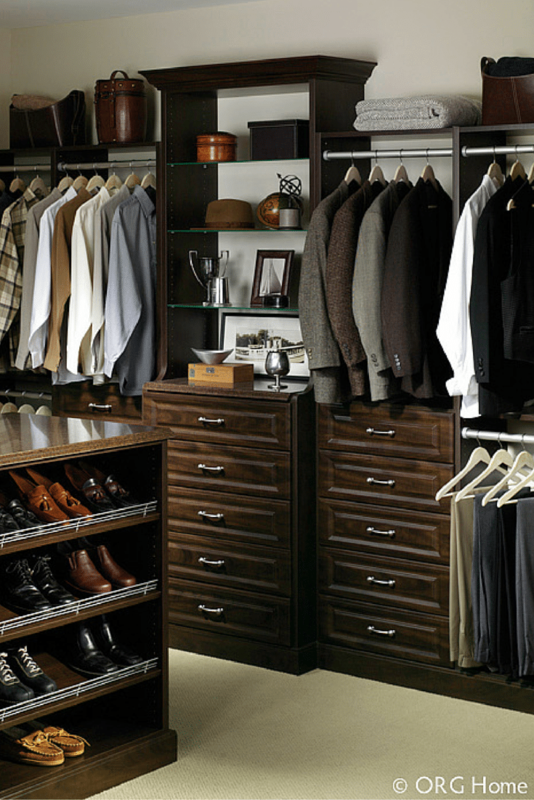 Question #4 – Is your closet a reach in or walk in style? We may wish we had the glamour closets of the stars with a large open area with a couch, a chandelier and a full wall allocated for our shoes alone – but that is not the reality most of us live in today. If you or your kids have a simple reach in closet the best (and most cost effective) solution will often be a wall hung organization system. For a walk in closet where you want the cabinetry to compliment the décor (and provide more storage) you’ll pack the most punch with the floor mounted unit. 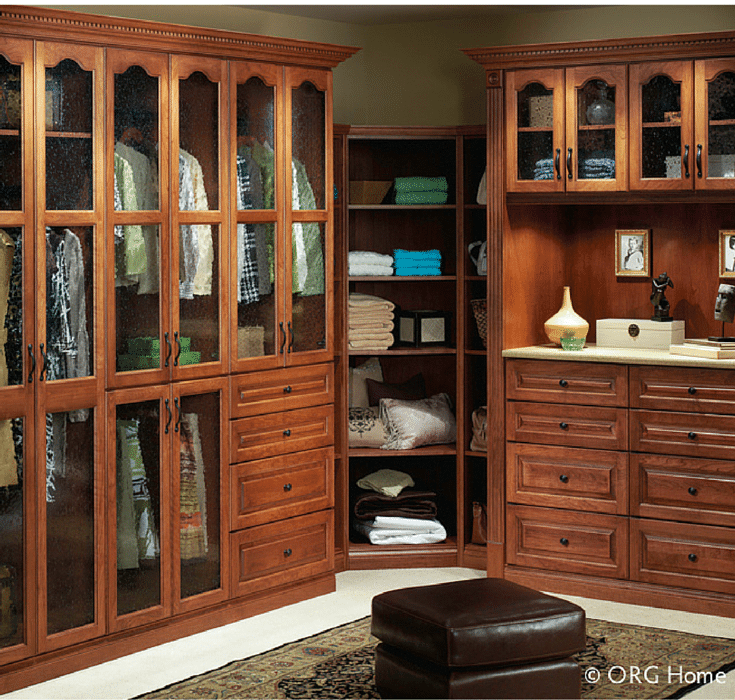 We have seen these more luxurious floor mounted closets really dress up custom homes in towns like Shaker Heights and Powell. Question #5 – What architectural design look do you like? A custom closet should be a logical and welcomed extension to your home (not a place you want to bolt the doors shut and hope NOBODY peaks in!). With that being said not all closet designs are (or should be) created equal. If you’re going for a minimalist urban look for a Short North or Little Italy condo the floating wall hung closet and shelving is a very cool. On the other hand if you want the classic built in custom furniture grade cabinetry look, a traditional floor mounted system is the logical selection. 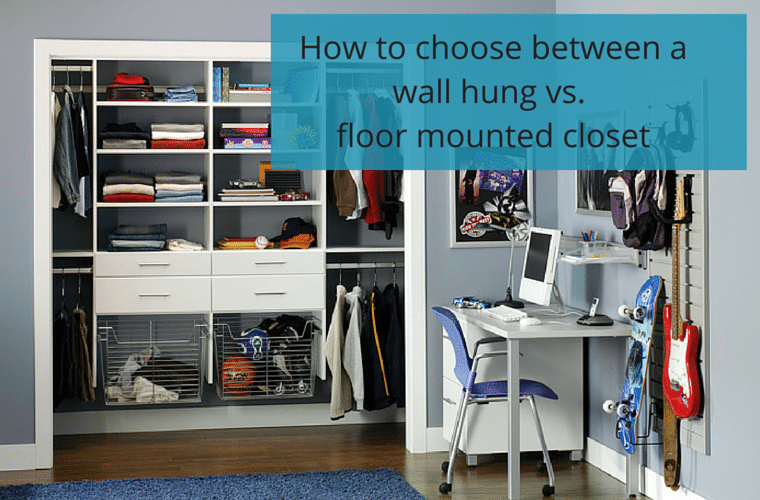 It doesn’t have to be difficult to choose between a wall hung or floor mounted closet organizer system. It doesn’t matter if you live in Columbus, Cleveland, or San Diego for that matter the selection process is the same. Look simply at is the type of closet you have now, how much clothes you own (or should own after you clean things out), your budget, the physical capabilities of those using the space and what type of design style you would like. If you would like more input on these systems – or a quote on a closet organizer system in Columbus or Cleveland markets email or call us on the numbers below. For help with a Columbus home organization project call Innovate Home Org in Columbus at 614-545-6888 or in Cleveland call 216-658-1290. I would like to know if you can install a floor mounted closet system on a floating laminate floor system or should it be mounted on the concrete/underlayment and the floor system laid around the cabinets. There are a lot of clothes that will be hung in this closet.